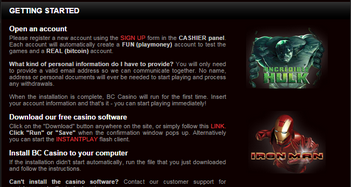 The main attraction is that BC-Casino is powered by PlayTech software. This is the only place I know of where US players can enjoy the latest Marvel and other slots games for real. Once you start looking into this casino, the legitimacy of their connection with PlayTech starts to become questionable. Many of the other trust signals which Bitcoin gamblers seek in a casino are also missing at BC, which is offering unlicensed versions of the PlayTech titles. Features of this Bitcoin casino include a 20% bonus on every deposit for as long as you choose to play. Of course the anonymity and speed of transactions which go with BTC are also big benefits. This review covers the BC-Casino in detail. First of all you’ll find information on the financial aspects of this operator. This includes the terms of the bonus offers and how to make your BTC deposits and withdrawals. Next, you’ll find an overview of the different games, including how they are organized on the site and accessed. The factors which indicate that these are not authentic PlayTech games are covered here. Finally, the trust signals, including licensing and fairness are examined in more detail. Playtech games may not be legal. Site is not mobile friendly. Desktop site is not very attractive. This casino uses a system of ‘casino credits’, these are 1% of a Bitcoin. You’ll play with these at the tables, and they’ll be converted back into BTC when you withdraw. This is different to the use of mBTC (1/1000th of a coin) at other Bitcoin casinos. Each time you deposit you’ll get 20% added to your account in casino credits. For example if you deposit 1 BTC, you’ll get 120 casino credits in total. This is for every deposit for as long as you play at BC-Casino. This bonus is non-cashable, and will be removed from your total at the time of withdrawal, though you’ll get to keep any winnings accrued using it. There are no additional bonuses or promotions available at the time of writing. The registration process is quick and easy – with the only ‘personal’ information required being an e-mail address. There is a capture to type in, and your log-in password will be sent in a welcome e-mail which effectively verifies your address. Once you are registered you can try out the games in instant-play mode, or download the Windows software to access the games that way instead. BC-Casino has a 2-step cashier process, first you say how much you would like to deposit, with a 0.01 BTC (10 mBTC) minimum transaction. The next step gives you a receiver Id which you copy and paste into your Bitcoin Wallet. There is a ‘getting started’ link on the main menu, which gives you an overview of the process. This casino assumes you already understand BTC and have a wallet, since there are no links or extensive setup details. Withdrawing is super-simple, you just say how much and press withdraw. Your deposit goes back to the last wallet Id used to deposit. There are no fees or restrictions for withdrawing at this casino, there are some payment issues discussed online, though on the whole payments seem to be straightforward here. While this is not the full suite of PlayTech games and slots, there are more than 100 titles to choose from including the big-name slots and popular table games. This is not a genuine PlayTech casino, and the games are being used without a license. Differences between this and genuine PlayTech casino include a non-standard login and game-launcher. If you choose Instant Play, a new window opens with a menu system. Live dealer games are listed here, though greyed out for the moment – indicating that BC should follow the other Bitcoin casinos an implement those soon. Organization of the slots available is not good for new players. Once you click the main slots icon you get to a second menu page which differentiates the games by the number of lines. There are 9 choices here, with 5, 8, 9, 15, 20, 25 and 30 lines – then classic and video multi-spin. With a selection of great games behind each of these, the choice is not the issue. It just takes some guesswork (or trial and error) to work out where the best games actually are. 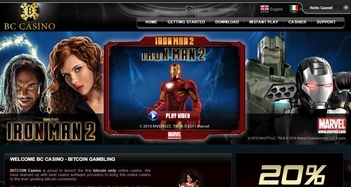 The big name Marvel slots including the Incredible Hulk and Iron Man 2 are behind the 25 line icon. There are also other favourites here including Jazz Club and Gladiator. You will find some games with progressive jackpots, though these do not appear to be linked to the main PlayTech jackpot pools. 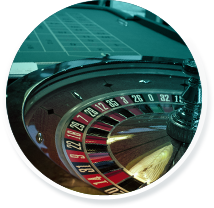 Table games are limited in the Instant Play mode, with only Blackjack, Baccarat and 3 Roulette Games available. You’ll be able to access many more PlayTech table game titles via the full Windows download. Other games include Video Poker and a dedicated selection of ‘new games’. Unlike other casinos, this operator does not store your favourite games. While the games are amazing, the organization of these is not well thought through at this casino. For example, there is no ‘back’ button when you play a browser game – meaning you have to switch off the new window and start over to change tables. The terms and conditions indicate that BC-Casino is licensed and regulated by the government of Panama. I was not able to find any link to the license information or direct to the authority on their website to verify this. The owner is listed as Global Entertainment Services Limited, which is similar to a company which holds a permit in Kahnawake – though is not the same. This does feel rather deceptive. Illegally ripped PlayTech games represent a significant risk to players at this casino. The site could be shut down at any moment, and player funds potentially taken with it. With opaque ownership and very little in the way of contact information, players would have no recourse should this happen. While the owners may have good intentions, it is difficult to recommend this casino due to these risk factors. I would not recommend depositing here. If you really would like to check out the PlayTech games, then make sure this is with BTC you could afford to lose and that you cash out at your earliest opportunity. To sum up this casino, their one huge advantage is the PlayTech games. On every other measure, from website design through bonuses and to trust signals, they are poor.